Plan the Perfect Ocean City Vacation! So many options. So little time. Don't get overwhelmed by the choices. 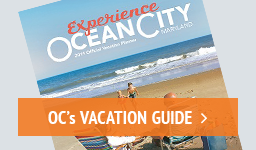 Whether you're planning a family beach trip, a romantic getaway or a weekend outing, the Ocean City Trip Planner can help you make the most out of your vacation days. Browse the incredible number of things to do in OC, add your favorite selections, sort them according to your schedule and share your itinerary with friends online. Whether you're reserving a hotel room, a restaurant table or concert tickets, remember to directly book your dates by contacting the selections in your itinerary! We've made it easy by providing phone numbers and web addresses for each listing. Look for the "Add to trip planner" icon throughout our website, for an easy way to plan your Ocean City, Maryland adventure. Just click on it, and whatever you're interested in will appear on a personalized list, below! You have 0 items. Browse the site and click on the "Add To Trip Planner" buttons to start adding items now!